Well the holiday shopping insanity is about to wind down in the next few days. That is almost exciting as Christmas itself! I always have a few people to buy for that I don't see till after the holiday and of course that means I can procrastinate a little longer. 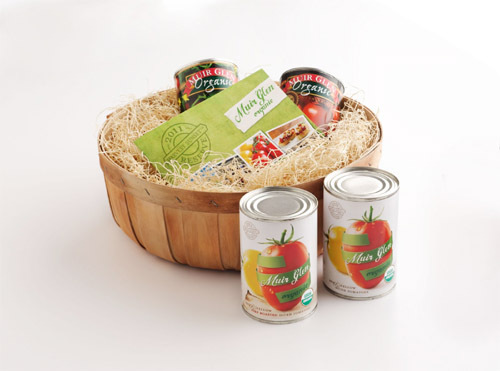 The 2011 Muir Glen Organic Reserve Gift Basket can a perfect, inexpensive gift for a foodie friend, co-worker, teacher, etc and for any occasion, not just holiday time. "Muir Glen long-time partner farmers cultivate 1,000 acres of organic soil in Northern California’s Yolo County. In late spring of this year, 13 of those acres were planted with our Reserve tomato seedlings. Chosen specifically for their exceptional sweetness, the Harvest Sunset™ Reserve--a blend of yellow and red tomatoes, offer unique but complimentary textures, colors and flavor profiles. Grown exclusively for Muir Glen under certified organic practices, and after months of thoughtful planning, constant attention and careful nurturing, the 2011 Reserve Tomatoes were hand-harvested at the peak of ripeness to guarantee the exceptional quality and taste you’ve come to expect from Muir Glen." This gift basket is sold for $10 (plus $5 shipping) and can make a really nice thank you gift or even a nice gesture for the New Year. Or even better - you have spent the past months shopping for everyone else, it could even make a nice gift for YOURSELF. I received free product in exchange for this post. All thoughts and opinions are my own.